This was sent to me by a Birkenhead native, outraged that his home town is now considered to be in Liverpool. 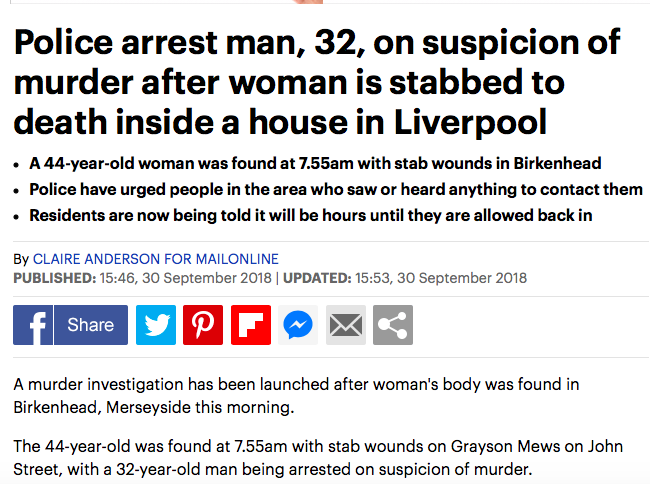 The two places are on opposite sides of the Mersey, so this is like saying that Grimsby is part of Hull, or that Portsmouth is on the Isle of Wight. I imagine the error arose because the sub saw ‘Merseyside’ and ignorantly equated that with Liverpool. Personally I would not consider it necessary to add ‘Merseyside’ to Birkenhead. The rule of thumb used to be that if a town had a football team you did not need to give the county. Birkenhead has a football team but it is called Tranmere Rovers, and it is obviously asking far too much for a Mail Online sub to know that.